I finally took some time to play with new products from the upcoming Holiday Catalog. One of my favorite stamp sets in this catalog is Stitched with Cheer. This set is intended for a kit, but the images and greetings are perfect for making any Christmas card. Since I'm not in the Christmas spirit quite yet, I decided to use a crazy color scheme of Flirty Flamingo and Night of Navy. 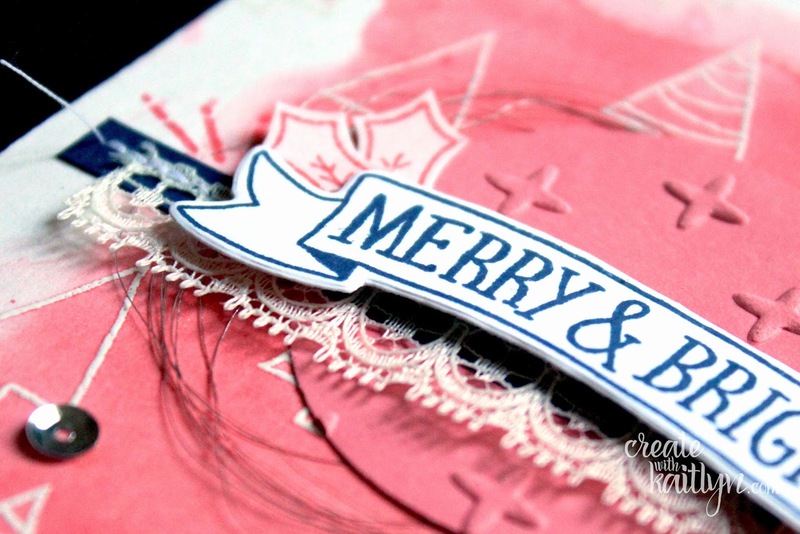 I have to say, I LOVE this color scheme for a Christmas card! I repeated a couple of the tree images and watercolored to create a fun background. The banners in the set coordinate with the Bunch of Banners Dies, making a breeze to cut them out. Layers of lace trim, metallic thread, stitching, and sequins combine to make a really fun and unique card. If you are looking for a little more inspiration on this Monday, be sure to use the buttons below to continue along the hop! So soft and pretty.....really like the unconventional colors!